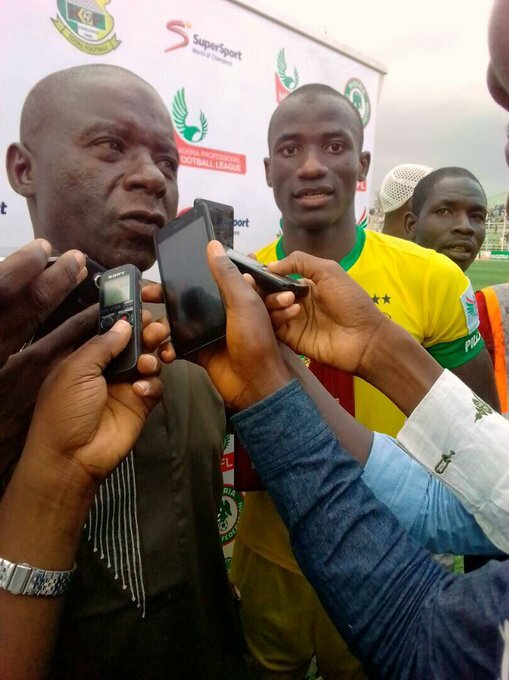 Kano Pillars gaffer, Ibrahim Musa, addressing the press after a match. Kano Pillars pair of Ibrahim Musa and Nyima Nwagua have been named Nigeria Professional Football League (NPFL) Manager and Player respectively for June by the League Bloggers Awards (LBA). Musa, only in his first season in charge as head of the Kano Pillars coaching crew, led the club to an unbeaten run in the month of June. Kano Pillars played five matches and finished the month without a defeat. They defeated Lobi Stars, Sunshine Stars and MFM FC in their home games played behind closed doors and then got two draws on the road at 3SC and ABS FC. Musa beat Gbenga Ogunbote of Enyimba, Bala Nikyu of Wikki Tourists and Enugu Rangers trainer Chukwuma Agbo to the June award in the manager's category. Nyima, on the other hand, saw off the challenge of Lobi Stars forward Anthony Okpotu, Adesina Gata of ABS FC and Musa Newman of Akwa United who came a close second in the race for the player's award. The Kano Pillars striker accounted for three of his club's nine goals. He scored twice in their 2-1 home win over Lobi Stars and then netted once in the 3-1 success against Sunshine Stars, also at home. On Matchday 26, Nwagua turned provider for Rabiu Ali's goal which earned them a point at ABS FC in a contest that ended one-all. The former Lobi Stars man simply cracked it ahead of Newman as his team finished top of the pile for June with his contribution being a key factor. It is the first time that both Kano Pillars men are winning the LBA monthly award.